Editor’s note: We asked Alegria Fresh – an amazing, sustainable farm right here in Orange County – to provide a recipe each month for our weekly series. (You may remember hearing about their healing foods dinner in March.) We’re excited to try these out, enjoy! We believe that everyone wants to indulge now and then, and few foods are more nutrient packed indulgences than raw cacao. 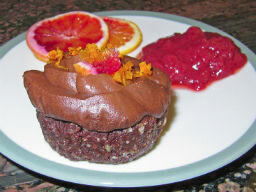 Why not have an “indulgent” raw cacao cupcake loaded with superfoods, protein and antioxidants? There are only so many calories one can eat in a day, so pack those calories with as many nutrients possible to support energy, health and well-being. And…satisfy your chocolate craving! 1. For the cupcake, combine all ingredients in food processor until it holds together. Start with the dates, and dry ingredients and add the wet ingredients and oil last. will release the oils from the nuts. 3. Scoop up the mixture and press into cupcake tin. Refrigerate. and stronger, making them naturally more pest-resistant. schedule a tour, please visit www.AlegríaFresh.com or follow on Facebook and Twitter.